Arkansas voters approved Issue 4, dramatically expanding the state’s potential gambling infrastructure. Two gaming facilities will now be eligible to offer “Las Vegas-style” games and two more jurisdictions can apply to operate full-scale casinos. Assuming they pass further approvals, all four will be eligible to take sports bets. These will be the first legal casinos in the modern history of the state. Voters approved the measure by a narrow margin. The vote drastically shifts the gambling landscape in Arkansas, one of the states with the nation’s most restrictive gaming laws. With the affirmative vote, the majority of the state’s population will be within an hour drive of a casino. The state will also likely take its first sports bet sometime in 2019, becoming one of the first to do so and almost assuredly just the second in the southeastern United States, after Mississippi. Pine Bluff, in Jefferson County about an hour south of Little Rock, would be able to open a casino. This is subject to further approval from local officials. Russellville, located in Pope County about an hour northwest of Little Rock, could also apply to open a full-scale commercial casino. As with the Pine Bluff facility, it would be subject to further approvals at a local level. Oaklawn Racing & Gaming in Hot Springs, a thoroughbred horse track, can now offer casino games. Home to the prestigious Arkansas Derby, the facility will now be able to provide a full complement of other gaming options. Southland Park Gaming and Racing in West Memphis, a greyhound track, will likewise also be able to offer casino games. The possible new gambling opportunities come after a well-financed campaign from supporters. As with gambling expansion measures in other states, most supporters touted the financial possibilities for Arkansas under Issue 4. This was most notably championed by a group called Driving Arkansas Forward. The organization ran a series of television and internet ads that highlighted the new tax revenue potential with the gaming centers. 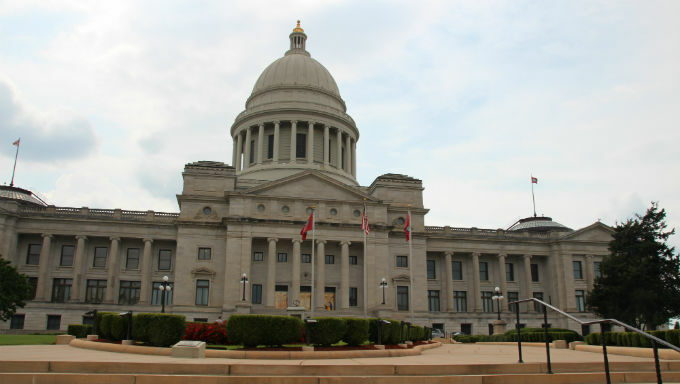 The group, as its name implied, particularly focused on the benefits to Arkansas roads. In marketing materials, supporters cited studies that showed a “yes” vote could generate 6,000 new jobs and $5.8 billion to the state economy within the next decade. High-profile supporters included Arkansas native and former Super Bowl-champion coach Barry Switzer, who appeared in marketing materials. Gambling stakeholders, not surprisingly, also backed the bill. The Quapaw and Cherokee tribes contributed more than $4 million combined toward Issue 4 support. Long shut out from the Arkansas market, each tribe will likely apply to operate one of the casinos now permitted under the new ballot measure. These efforts proved more than enough to overcome the state’s long-held skepticism toward gambling. Local religious leaders and anti-gambling advocates publicly opposed Issue 4, as did their national-level counterparts. They previously petitioned the courts to strike the issue from the ballot, but their efforts were shot down after months of back-and-forth legal rulings ended with a decision by the state supreme court to keep it before voters. These groups failed to keep up with advocates financially, raising only a few thousand dollars. Going forward, the state will likely have new gambling tourism destinations that will help keep a significant portion of the estimated one million casino visits taken by Arkansas residents annually from crossing state borders. It also helps the Natural State keep up with a surprisingly vivacious gambling industry in the American southeast. With Mississippi already an established gambling destination, and Louisiana coming off a massive expansion of it daily fantasy game offerings, Arkansas will now keep pace in the area – and become a new gambling frontier for other traditionally gambling skeptical states in the nation as a whole.